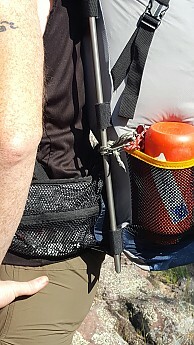 The ExoTi 50 is Vargo’s second generation titanium frame pack. 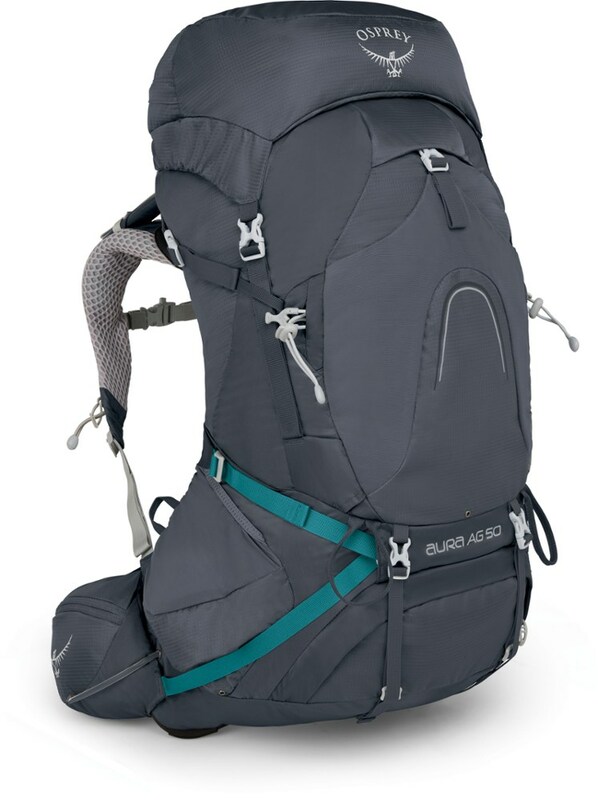 This 50-liter pack is certain to appeal to those who love the external frame backpack. 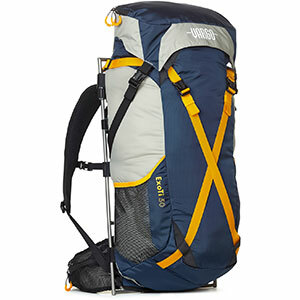 Incredibly comfortable and significantly improved over its predecessor, the ExoTi 50 is a pack worthy of serious consideration. Did I mention EXTREMELY comfortable? In Spring 2014, I tested Vargo’s Ti-Arc. I instantly fell in love with that pack, and it has been my go-to backpack for more than three years. As much as I love the Ti-Arc, it does have its drawbacks, and my review listed a number of suggestions to take that unit from great to amazing. Now, Vargo has captured my affections with its ExoTi 50, and I’m not sure how to break the news to the Ti-Arc. Look, I’m not suggesting Vargo stole any of my ideas from that 2014 review. I’m stating categorically they stole all of my ideas and put them into the ExoTi 50. And I couldn’t be happier about it! The subsequent improvements with the ExoTi 50 are just what was needed. 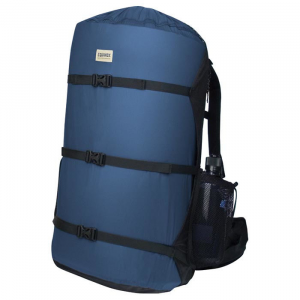 Vargo has kept the comfort of its original titanium frame and floating lumbar support. 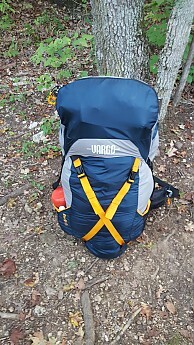 In my opinion, the changes to the body of the pack has moved Vargo from a weekend pack to a thru-trip pack. 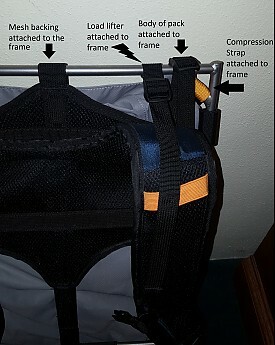 An Internal External Frame Pack? 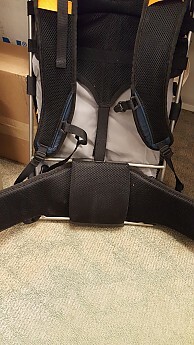 As I tested the ExoTi, I kept thinking this looks like an internal frame pack; it rides like an internal frame, but it has the comfort of an external frame. So I was bemused when I finally went to Vargo’s website (after testing) and saw their marketing focused on combining the best of internal and external frames. External vs. Internal. Which is better? We've finally settled the debate with a resounding BOTH! The ExoTi™ 50 takes the best from both internal and external framed backpacks for unprecedented load transfer and carry comfort. The marketing is spot on. 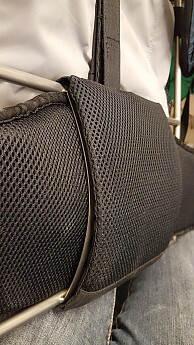 Take a look at the pics below and see if it doesn't look more like an internal frame pack. 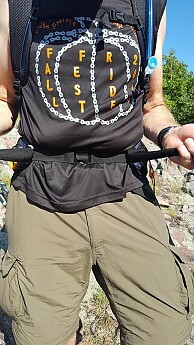 Out on the trail, I had two hikers assume I had an internal frame pack until I pointed out otherwise. 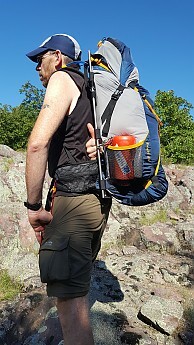 Put bluntly, Vargo makes the most comfortable packs I have ever carried. I have never tried another pack that even comes close to how these packs carry. Knowing they have a winner, Vargo has retained the same frame design* on all their packs. The mesh back allows air to move along your back, staying cool and comfortable. There is a significant gap above the lumbar plate that keeps your sweaty back away from the pack. Yeah, that's my arm slipped in between my back and the pack. Except for the lumbar plate, every contact point with my back is a mesh panel. The gap and mesh allow air to flow through, keeping my back cool. The adjustable lumbar plate is simply the best part of all their packs. The comfort is astounding. 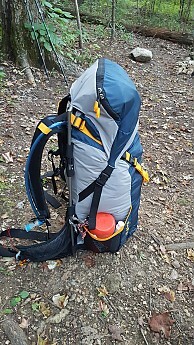 External frame packs are often considered top heavy and cumbersome. The design of the ExoTi defies this stereotype. 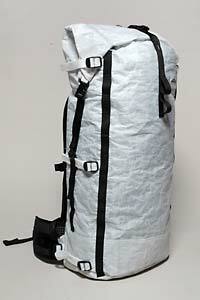 The compression straps do a great job at keeping the pack quiet and making it ride like an internal frame pack. The load lifters (see picture below) are placed wider than some external frame packs I have used. To me, this made them more effective and comfortable. The ExoTi is adjustable for torso lengths of 16-22 inches and comfortably fits my 6'2" body. They fixed the belt! In my Ti-Arc review, I was critical of the limited belt size. At the time of that review I had a 34" waist, and I had nearly bottomed out the belt. My current waist size is 32", and on a week-long hike in April, I found I could no longer cinch the belt tight enough by the last day. The ExoTi has been changed to provide a much wider range in the belt. There is now plenty of room for smaller people to carry this pack. *Clarification: I have stated that Vargo has both changed and kept the frame design on its packs. 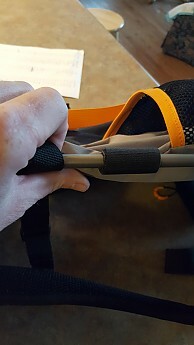 The changes are in the top of the frame that impact how the body of the pack is attached to the frame. I was critical of the Ti-Arc’s top prongs that caught on passing vines. These have been removed, and the ExoTi attaches by velcro (Yeah, but it works! See the lowest of the three pictures below). The lower portion of the frame, with its lumbar plate remains the same. The Ti-Arc, with its prongs, is on the left. The ExoTi, right. 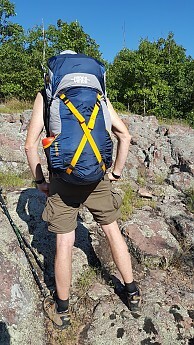 Other Review Corps members asked me if the change in frame design would make this pack suitable for bushwacking. My answer is, "I don't know." 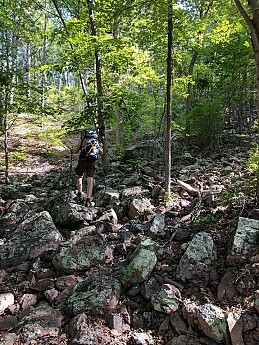 I rarely hike off trails, and I was never off trail with this pack. On the trail I never caught any low hanging vines or branches, as I have with the Ti-Arc. 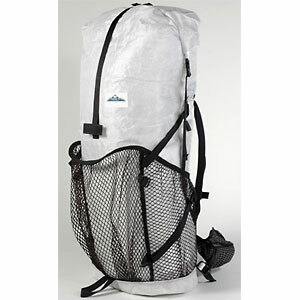 Vargo lists the pack body as "nylon." I assume this is the same 70 denier ripstop nylon used on the Ti-Arc. At least the feel was the same. How well that would hold up while bushwacking seems a little sketchy to me. But again, my excursions off trail are usually only to dig catholes. As the name implies, the ExoTi is a 50-liter pack. This is plenty of room for a light hiker like myself to pack in everything I need for a thru trip. On weekend hikes I found myself packing less efficiently (ie, I didn’t compress my top quilt or under quilt) in order to fill up the body of the bag. Vargo has redesigned the body of its packs by changing over to a top loader. This is a huge improvement on the pack and removes one of the chief criticisms I have seen plastered all over the web. The removable float top is also a new feature, and one I had suggested for the Ti-Arc. 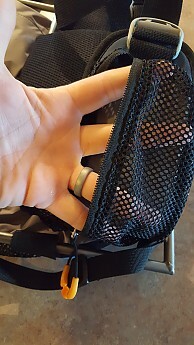 The two mesh pockets on the pack are larger than on the Ti-Arc. 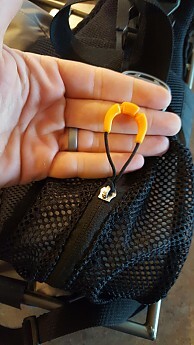 These pockets easily held a Nalgene bottle, and I was less concerned about items falling out. The hip belt pockets seem larger to me. I am not sure if it is that or if they are simply placed differently to give more adjustability to the belt. In either case, I find these pockets more useful on the ExoTi. Two things I would have liked to see on the ExoTi. In my Ti-Arc review, I was critical of the “ultra-light” claims made by Vargo. This go around, Vargo has dropped the UL marketing hype^ and focused on the comfort of the ExoTi. At the same time they have taken a significant step towards being an UL pack. No, the ExoTi is still not an UL pack, but when you start comparing it to ultralight packs, you realize they are getting close. Especially when you consider the ExoTi can carry more weight than the sub-2lb packs. But keep in mind this is an external frame pack. 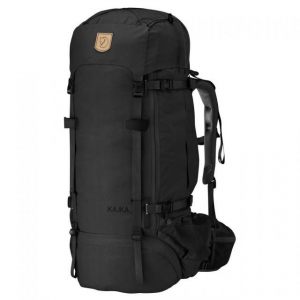 It carries so much more comfortably than many UL packs, which can feel more like a rucksack, than a framed pack (Don’t hate. I’m not talking about your amazingly comfortable UL pack. It’s those other brands.). Additionally, only a few external packs are under 4lbs. I have seen some listed at 9lbs! 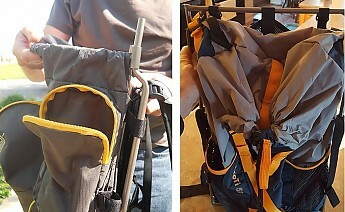 ^Vargo still states the frame of the ExoTi is ultra-light, but overall they are not marketing the unit as an UL pack. 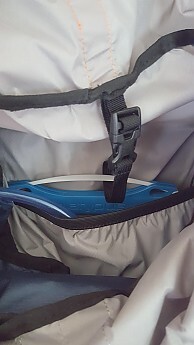 For those who prefer a pocket for their hydration bladder, the ExoTi provides this. I appreciated the strap at the top of the pocket to keep the bladder from sinking down as it empties (see pic below). I would have liked the ability to thread the bladder hose through either side of the pack. My preference is to have the hose on my right side. The only option is the left side. 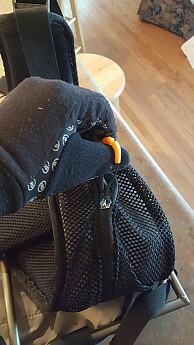 The zipper pulls are larger, more visible, and easier to use with gloves. This is a big plus in my book. Vargo has addressed most of the criticism leveled against the Ti-Arc. They have retained the comfort, lightened the load, increased the volume. 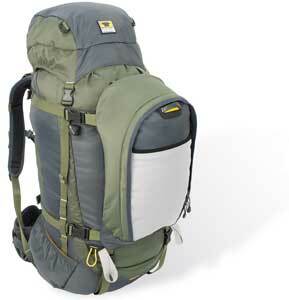 The pack is not officially UL, but is worthy of the attention of UL hikers. Now I just need to find a way to tell my Ti-Arc that we’re breaking up. So you're saying you like it? Thanks for testing out this new pack and reviewing it, Goose!